When you need a spot to place your favorite book or beautiful lamp an end table or night stand is the answer. LodgeCraft has the finest selection of rustic, mountain modern, log and mission end tables, online and locally available in our two Montana showrooms. Choose from pine, alder, hickory, and aspen tables that are Made in the USA, or select from our imported tables made from the finest hardwoods displaying exceptional quality. 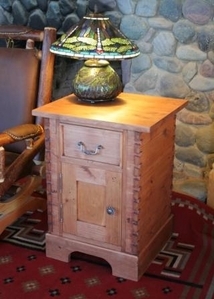 For over 20 years LodgeCraft has been building and selling furniture from Eureka, Montana to suit your rustic tastes. Log Edged Birch Top End Table 24"